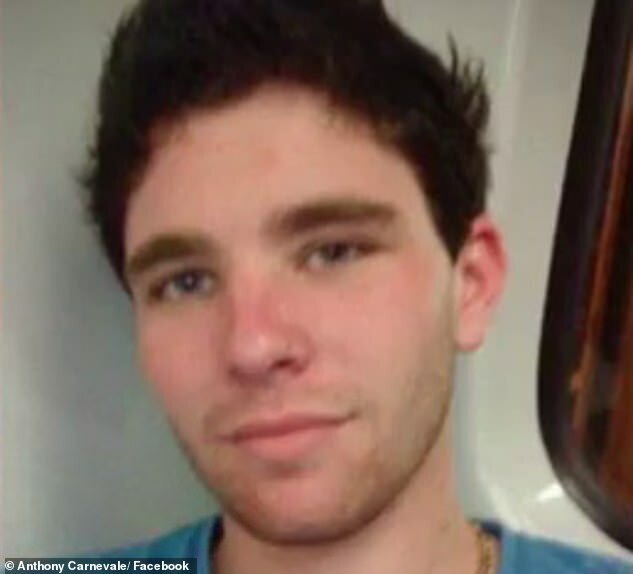 The video was released following an investigation by the Coroner’s Court of Victoria into the incident that caused the death of 24-year-old Anthony Carnevale in 2015. Viewers have noticed a man walking on the pavement appears to vanish from the exact spot where the truck explodes merely moments later. ‘Does anyone else see the person walking on the footpath disappears into thin air,’ one viewer commented. ‘A person walking literally vanishes and seconds later the truck explodes,’ writes another. ‘No one else notice the time traveller vanishing in the background?’ another viewer writes. There may, however, be a more logical explanation than a time travelling pedestrian. Some eagled-eyed viewers noticed the person vanishes at a point where there are no other moving objects in frame – suggesting the editor of the video added a cut at that point. Tragically, Mr Carnevale was killed instantly after the rental vehicle exploded at a Footscray intersection in Melbourne’s west in 2015. 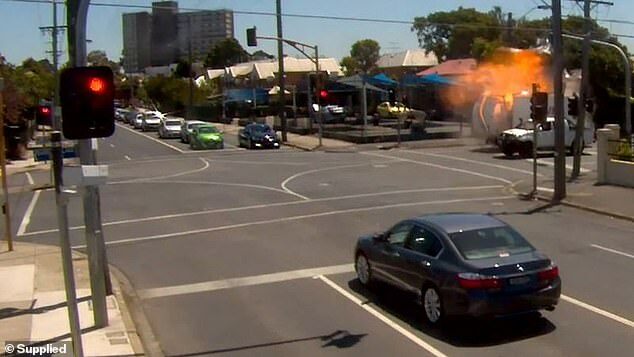 The Coroner’s Court of Victoria released footage of the incident after concluding Mr Carnevale’s death was caused by a gas leakage and spark from an un-capped 12-volt battery, 9News reported. Mr Carnevale was transporting his barbecue and gas bottles to his new house when the truck went up in flames. The driver, who didn’t know the bottles were partially open, was said to be thrilled about moving into a new space. 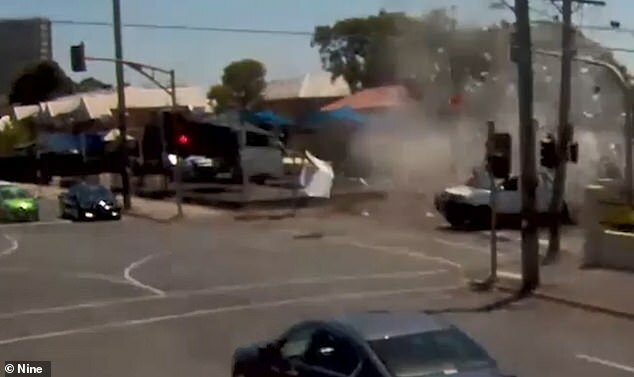 The confronting footage shows the truck travelling through the intersection before suddenly exploding – sending debris flying across the busy road. Nearby cars were damaged and debris struck powerlines, setting off another smaller explosion and shattering nearby apartment windows. 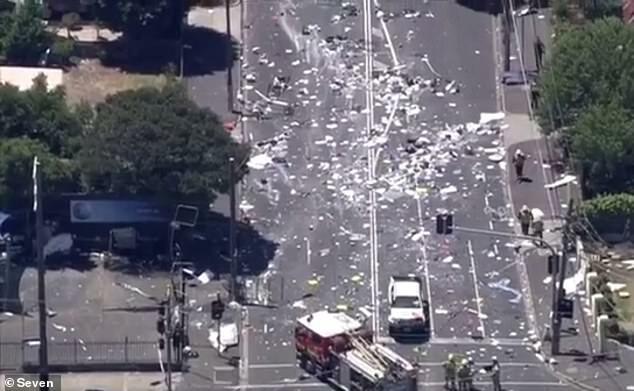 Victorian coroner Paresa Spanos said it was remarkable more lives weren’t lost. A pedestrian only narrowly missed the fiery blaze. Footage shows him walking down the footpath and off screen only seconds before the Avis rental truck appears. 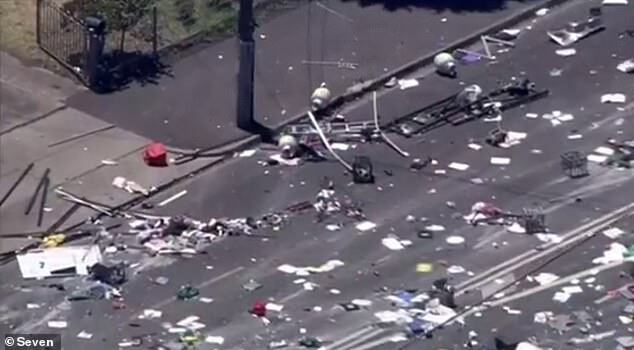 Shocked motorists who were stopped at the set of lights were seen cautiously making their way toward the wreckage. 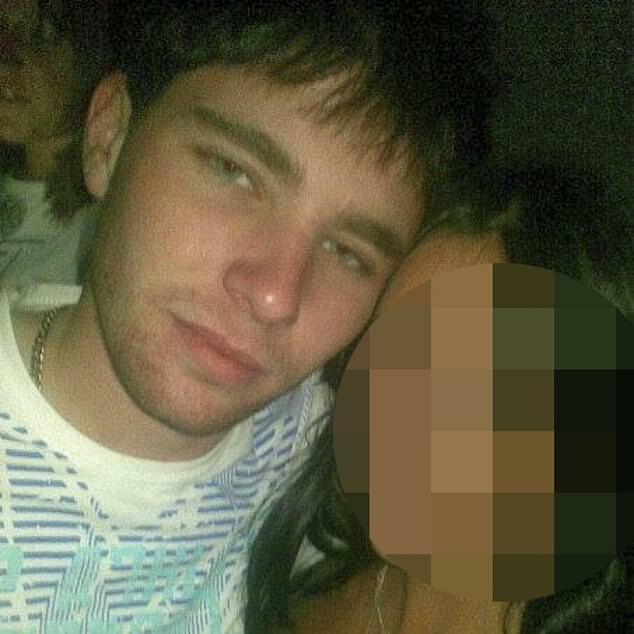 ‘It was basically like his car became a bomb,’ a witness told 7News. Stills of the footage show the moment pressure destroys the back of the vehicle, sending the back doors flying and flames spewing out at every angle. Metropolitan Fire Brigade’s extensive search concluded human error may have been a contributing factor, with all three gas cylinders Mr Carnevale was transporting found to be loose. Coroner Spanos suggested Energy Safe Victoria took steps to increase public awareness, through a campaign or otherwise. LPG have committed to taking preventative measures by introducing mandatory safety valves into cylinders from 2020 onwards. Experts warn against transporting gas cylinders in a car’s cabin. A boot or semi-open space is a safer option, they say.